James Moody’s full-bodied sound on tenor was always original and hard swinging, but as he demonstrated leading these fine small bands, he felt equally at home playing alto sax or flute. “Cookin’ the Blues”, the first album here, features his septet recorded live at the Jazz Workshop in June 1961, during his tour on the West Coast. Moody, wonderfully relaxed and in good form, fronts a band (with trumpeter Howard McGhee in his come back to the coast) offering inspired performances and more musical content than groups with a bigger name. Eddie Jefferson was also was one of the moving forces behind the whole show, with his humorous, and happily frantic singing. 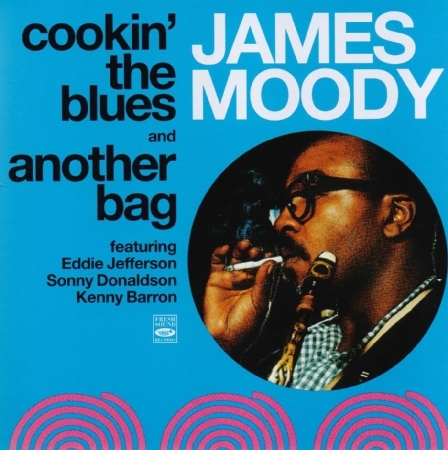 All seven songs in “Another Bag”—the second album of this compilation—are excellent originals. Tom McIntosh, arranger on the date, contributed five, with his craftsmanship throughout distinguished by skillful voicings, interesting harmonic structures and beautiful melodies, somewhat reminiscent of the writing of Tadd Dameron and Gigi Gryce. Besides a forceful and driving Moody, the group features the consistently effective Paul Serrano on trumpet and the excellent solo and comping of pianist Kenny Barron. Paul Serrano, trumpet; John Avant, trombone; James Moody, tenor sax & flute , Kenny Barron, piano; Ernest Outlaw, bass; Marshall Thompson, drums. Tom McIntosh, arranger. The second LP contained here has a slightly different sound but again, good, clear ensembles. We get to hear the other players take solos too, including bassist Outlaw who precedes the leader on Sassy Lady. Moody is in a bright, boppish mood on these pieces, swinging along merrily with the rhythm players pushing him. Some early examples of the flowing solo style of Kenny Barron are on offer on this session. The live music on 1 to 9 is more spontaneous and off the cuff but the studio pieces sound more organised and worked through. Serrano has some lyrical trumpet solos that contrast nicely with the leader’s bop horn."